It may be tempting to install wooden window sills, especially for a builder, because the cost is unbeatable. All you have to do is cover it with a coat of paint, and everything looks like new! Even a small amount of stain will make a wooden window sill gleam and look quite attractive for almost no money down in the grand scheme of things. However, things are not always what they seem when it comes to contracting. Why would anyone want to spend thousands of dollars building a structure only to install temporary materials that will eventually need to be replaced at some point? The one industry that you absolutely should not cut costs on is construction. When constructing a building, you want it to last for years to come. So installing wooden window sills wouldn’t be the wisest choice because even when treated. After all, the organic composition will inevitably break down and decay. You want to create a structure that’s going to last, and while wood materials may have been the regular thing to use for past builds, that’s has changed. This is because builders have realized through the renovations of older and even some newer homes, that wooden window sills stain, rot, and deteriorate. They also serve as food for carpenter ants, and other bugs. Installing wooden window sills is like ringing the dinner bell for such critters! What used to work then doesn’t necessarily have to be the staple to your building material today. The only reason wood was always used is because it was cheap to get. But builders are recognizing the benefits to installing a superior type of material in place of wooden window sills, and that is marble. Marble window sills are considered the superior material for window sills because it simply lasts longer. Marble won’t stain like wooden window sills, and they will not rot or crumble away. In fact, marble window sills may very well outlast the build of the entire structure! In some cases, antique marble window treatments have actually been removed from older buildings with the intent of placing them in either new structures or adding them to someone’s eclectic collection. Both cases help to illustrate the longevity of marble. While you might think that the untreated raw back of a window sill might eventually come apart, marble doesn’t crumble the way that wood or synthetic materials do. It’s also impervious to fire and other hazards, which makes it popular with those who want to plan for every possible eventuality. If you plan on being prepared, then you’ll want to look into marble window sills. This is the type of durability and assurance you want to build for your brand name as a building contractor. People are willing to pay for such quality. The strength of this type of stone alone is worth incorporating into your builds because you can install this as a raw material without the need to paint it and add a coat of paint every other year or so. Another disadvantage to wooden window sills is that they are easily damaged. With enough force, the surface of your window sill can be grossly damaged. For instance, hail storms from exterior exposure, or interior casualties that movement of furniture or the playful casualties that children can bring about all can damage a wooden window sill, but not so with marble. Marble window sills will be able to withstand the harsh conditions that exterior weather can bring as well as any man-made disturbances. It’s waterproof and fireproof. One of the great benefits of stocking a bulk amount of marble window sills is that you can use them in other creative ways. It’s all about how creative you and your interior design crews can be! Marble window sills come in 3 standard lengths: 36″, 56″, and 74″. The thickness of the window sills starts at ⅝”, but at Stonexchange, your marble window sills can be custom ordered to produce ¾” thick window sills. 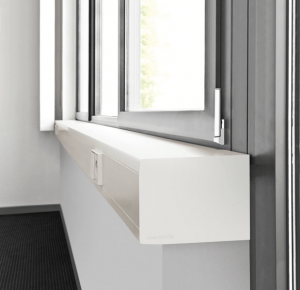 The actual opening of a door varies in sizes, so Stonexchange offers window sills in widths ranging from 3” to 12”. If you need something outside of this size range, then Stonexchange can manufacture it for you, but you’ll need to keep in mind that custom order marble window sills aren’t cut on site. They would need to be cut from our quarry and shipped overseas to you. That’s why you’ll need to allow at least 10 weeks of lead-time, and it’s important to remember that when you’re planning your construction builds. Stonexchange is a natural stone wholesale manufacturer of marble window sills, thresholds and soap shelves. We have access to our own quarry in various countries, so we always have an ongoing shipment of quality marble window sills coming in on a consistent basis at our Miami location. The type of marble window sills that we have available are sold at wholesale prices. This means a minimum quantity is required in order to get a discount price, and it this quantity will be in bulk. If you require less, then we can refer you to a distributor who sells to end-users as we supply thousands of marble stone suppliers in the United States. Based on this, Stonexchange has been able to reduce our inventory selection based on the most popular trends and demands in the natural stone industry. These specific selections are complementary to any décor whether you are looking for something to blend in or create a direct contrast in a space. In addition to marble and granite, we also offer window sills in travertine. Even though you might be used to thinking of that as marble, it’s technically a different type of light-colored porous calcite stone that’s actually closer to limestone in some ways. Nevertheless, it doesn’t deteriorate the way that traditional limestone would so you can generally consider it every bit as durable as marble. On top of that, we also carry ones made from A more traditional natural limestone product that’s referred to as Euro Beige. It matches well with any project that calls for cuts of Mocha Creme or Crema Europa material. Because of the type of cut, marble window sill can be pretty fragile. Even with the most careful packaging, there is a risk of damaging one. Whether it’s through the shipment, or during transit from the warehouse, to the building site, it’s recommended to order more marble window sills than projected. It’s always best to have too much inventory than not enough. Stonexchange stocks one crate with a minimum of 50 marble window sills that’s securely packed away and suitable for nationwide shipping. To learn more about stocking your warehouse with marble window sills, and why you should seriously consider replacing your wooden marble window sills inventory with marble, contact us online today and get in touch with one of our knowledgeable representatives!